Desktop URL shortening tool (beta). Is there a better alternative to yourls? Is yourls really the best app in Internet Utilities category? Will yourls work good on macOS 10.13.4? 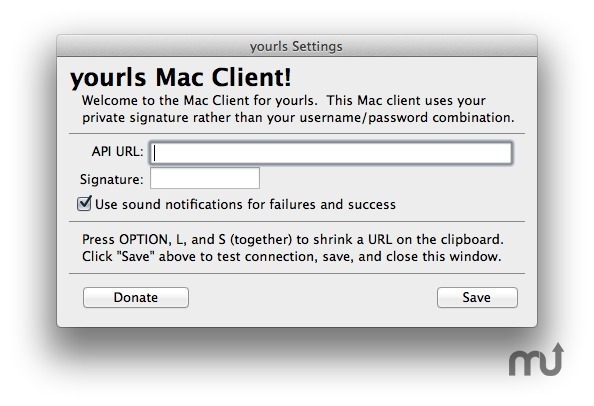 yourls is a desktop client for the yourls URL shortener. This app will shorten urls with your installation of yourls. You must install yourls on your webserver to use this. It is not a public URL shortener. The yourls Mac client is a very simple app to have a global keyboard shortcut send a link to your installation of yourls. When a link is received in response it is copied to your clipboard so you can paste it. yourls needs a review. Be the first to review this app and get the discussion started! yourls needs a rating. Be the first to rate this app and get the discussion started!